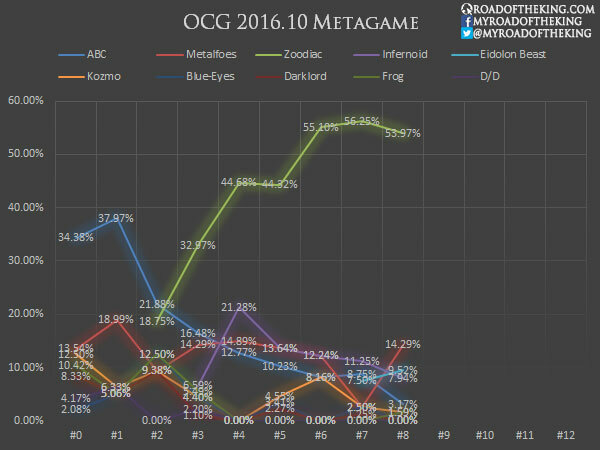 Welcome to Week #8 of the OCG 2016.10 Zoodiac format. 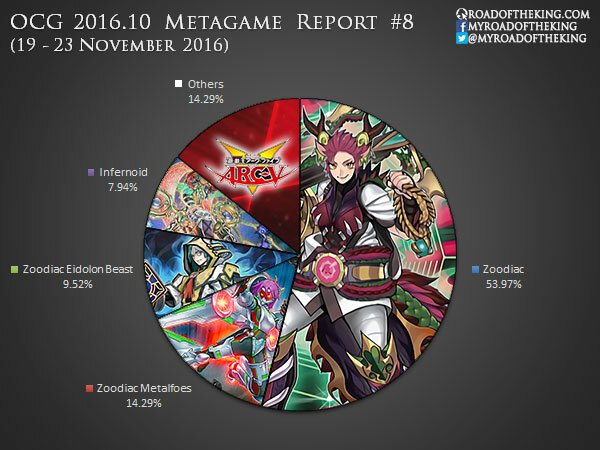 This report will cover 63 top-performing decks from 10 Japanese tournaments that were held during 19 – 23 November 2016. Update: Added “Kita-Osaka CS with Hatti CS” and “2nd K-1 Grand Prix”. Flying “C” is making a return this week as a tech choice against Zoodiac. Flying “C” was initially a poor choice as earlier builds of Zoodiac had outs in the form of Elemental Triangle of the Zoodiac, Book of Moon and Book of Eclipse. But as Zoodiac started dropping Book of Moon and Book of Eclipse, leaving with just Elemental Triangle, they had become quite vulnerable to Flying “C”. As a countermeasure, Zoodiac are running Forbidden Chalice instead. Forbidden Chalice is not only great against Zoodiac Drident, but also against Flying “C” and Fossil Dyna Pachycephalo. Fossil Dyna Pachycephalo has also become quite a threat as Zoodiac are no longer running Number S39: Utopia the Lightning and Diamond Dire Wolf in the Extra Deck. Despite Imperial Iron Wall having a regular spot in the Side Deck, Zoodiac Invoked is doing rather decently. 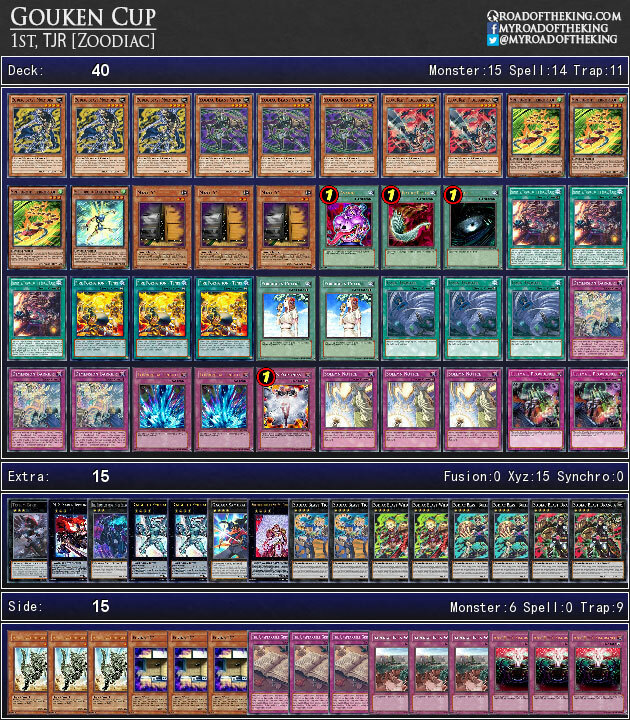 This is perhaps largely due to the Zoodiac engine having Zoodiac Drident as an easy out to Continuous Trap cards. In a similar fashion, Zoodiac Metalfoes fares quite decently against Anti-Spell Fragrance. we will see if there’s some change dimension box is released this saturday in ocg. How much will Zoodiac Beast Drancia be worth when it gets released in north America? How much is it worth so far in Asia? TCG rarity bumps everything that does well in OCG, so expect either it or Molmorat to be a ScR. Over 57% of those decks are pure zodiacs and lots of zodiac variants. Most decks will have 1 or 2 zodiac Drancia in the extra deck. Guessing that it’s going to be a secret rare in North America. Probably going to be the next pot of desires.